Named after the famous range on Long Island that hosted many long-range rifle competitions in the 1870s and ‘80s, the Creedmoor ladder-type sight is fully adjustable for windage and elevation and works equally well on cartridge rifles and muzzleloaders. Sight is precision machined from steel and attaches to tang with supplied setscrews and folds down when not in use. 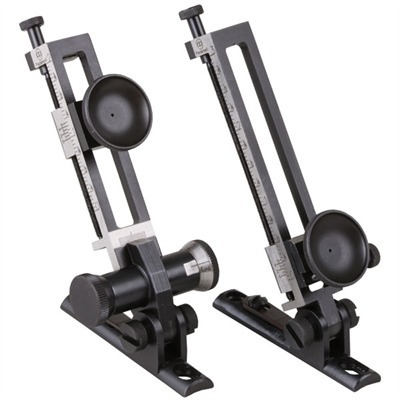 The Universal model is available in middle-range 2" and long-range 3" heights. The windage adjustment mechanism is on the eyepiece, allowing the eyepiece to dropped close to the base for close-in shots. The Soule model provides maximum adjustability to fit any hunting or target shooting conditions. Elevation is adjustable in precise increments of 1 MOA, and one full turn of the windage knob moves the point of aim left or right by 2½ MOA in ½ minute increments. Large knurled knob at the sight base allows fast, accurate return to center or previous setting. Choice of Short, Middle, and Long Range models. The “Goodwin” style sight was a popular sight for long range shooters in the late 1800s. The “flag” position allows for a very wide windage adjustment range of 1.26”. The elevation adjustment on the Goodwin has a range of 3.94”. With the Goodwin’s structure, the chamber can be easily accessed for cleaning or inspection. The Goodwin also has a “tilt” screw that allows the staff to be perfectly vertical at all elevations. SPECS: Steel, blued. Elongated rear mounting hole allows installation on most rifles. Drilling and tapping of tang may be required. Distance between mounting holes 2.20”-2.29” (5.6-5.8cm). Mounting screws and installation instructions included. PEDERSOLI DAVIDE & C. - RIFLE CREEDMOOR UNIVERSAL MIDDLE RANGE 2"